Is Hospital Indemnity Actually Worth My Time? At Senior Marketing Specialists, our goal is for all our agents to have a solid block of Hospital Indemnity business. Why? Because we believe in comprehensive client care and helping our agents make more money! If you’ve ever thought, “Is Hospital Indemnity actually worth my time?” the answer is absolutely. It’s okay if that isn’t enough to sway you. Read on to learn more about what Hospital Indemnity is, what benefits it holds for you and your clients, and the resources SMS offers to help you seamlessly incorporate HIP into your routine. Hospital Indemnity plans help cover areas of financial risk for your clients, especially in regards to Medicare Advantage. While Medicare Advantage saves clients on monthly premiums, it also exposes them to possible out-of-pocket costs. Many clients can’t afford out-of-pocket hospital costs. That’s where Hospital Indemnity comes in. Not only can it cover inpatient hospital co-pays, observational care, and ambulance rides, but it’s available at a much lower price than most Medicare Advantage plans. How do I Profit from Hospital Indemnity? Let’s talk about client acquisition cost. This is how much money it takes for you gain one new client. These costs may include money spent on marketing materials, your phone bill, your office utilities, the gas it takes to get to their house, and anything else that goes into communicating with a prospective client. It’s important to know your client acquisition cost as it differs for everyone and determines when your client actually becomes profitable! Selling a Medicare Advantage will usually cancel out your client acquisition cost after a few months of commission. Now, think about tacking a Hospital Indemnity plan onto that MA sale. You haven’t spent any extra money to sell them HIP, but you will receive a whole other commission check each month. Basically, that Hospital Indemnity commission is free money! And that’s how you profit from HIP. Your client profits by receiving a check to cover their unexpected hospital expenses. How Will SMS Help Me? Aside from our knowledgeable team and informative walkthroughs, our favorite Hospital Indemnity resource is the Fill-the-Gaps Tool on the SMS Quote Engine! If you haven’t signed up for our Quote Engine, you’re missing out. Our Fill-the-Gaps Tool allows you to choose a Hospital Indemnity plan that pairs perfectly with your client’s chosen Medicare Advantage plan. The side-by-side comparison allows you to customize the HIP riders and multiple options to balance out the out-of-pocket costs associated with MA coverage. This way, any costs your client accrues while in the hospital, medical or otherwise, are covered by a HIP check by the time they get home. 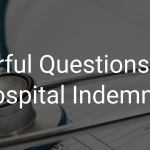 If you’re still a little fuzzy about the value of Hospital Indemnity, take a look at these frequently asked questions. How do I help a client submit a claim? Typically, you will need an itemized hospital bill and claim form. Each carrier has specific instructions, which Senior Marketing Specialists is happy to provide you with. Skilled Nursing, Ambulance, and Cancer riders are usually a good fit and provide the best value for clients. Other riders are likely to be used on a more case-by-case basis. What is the average hospital copay on an advantage plan? They vary quite a bit, but it’s often somewhere around $250-500 per day for 3-8 days. Usually, the longer the copay period, the smaller the daily amount and vice-versa. Hospital Indemnity plans range from $100-600 daily benefits that you can customize to provide an excellent supplement. We have a variety of marketing materials such as scripts, letters, and flyers. Medico also offers customizable flyers and postcards in many states that you can download for free from their website. For additional questions, contracting, and training, contact us! Hospital Indemnity: What’s in it for Me?